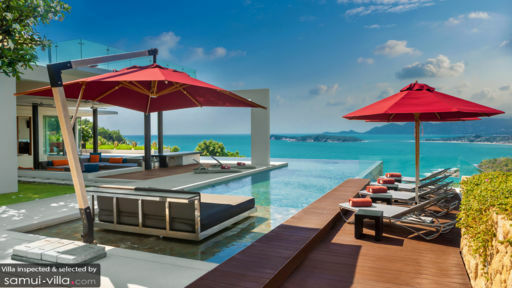 Villa Sangkachai is a modern holiday haven overlooking the Gulf of Thailand in Koh Samui with spectacular architecture, contemporary design, and sleek, stylish furnishings. Dominating the property is the L-shaped infinity swimming pool that visually cascades as one with the expansive girth of the ocean. 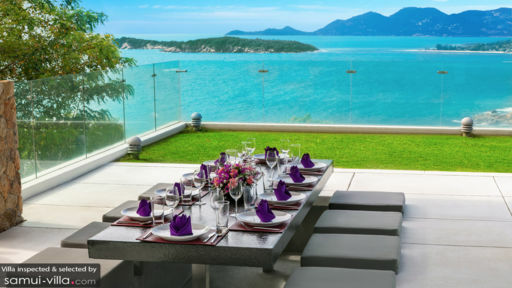 Traditional Thai accents can be observed around the villa with Buddha busts, intriguing artefacts as décor, and other. The villa boasts four elegant bedrooms and can accommodate up to ten guests. Locates near the serene beach of Choeng Mon, the villa not only offers immaculate living conditions but an idyllic setting. At Villa Sangkachai, there are four splendidly-furnished bedrooms that will leave speechless with their minimal décor, stunning views from glass walls, and comfortable beds. The master bedroom is located on the pool level with direct access to the terrace and oversized glass walls that promise a breathtaking view. Furnished with a king-sized bed, 32” flat-screen TV, work desk, and safe, the bedroom will soon become your second home. There is an en-suite bathroom with outdoor showers, dual basins, bathtub, etc. As you descend the staircase outdoors, you will reach the three guest suites at the villa, each connected to the balcony with outdoor seating. The bedrooms feature glass walls for endless views and are furnished with king-sized beds. They come with en-suite bathrooms with amazing amenities like indoor/outdoor showers and dual vanities. The villa is unlike any you have seen as it banks upon the splendid surroundings to ensure guests have the best time while relaxing against an enriching backdrop. As the ocean extend out in front of you bordered by lush foliage, you can relax inside the infinity swimming pool at the villa. A floating bed sits majestically in the pool, the ideal spot for lying back and enjoying the sunset. There are sunbeds littering the sun deck for sunbathing and resting. There is a NUVO music system in place for a pool party with some freshly grilled food and excellent company. On the roof top, you will find a splendid covered terrace with an alfresco sunken dining table for eight, a cosy lounge, a mini garden, and a gas BBQ grill. If you’re in a tropical destination, you can’t keep away from the spectacle that lies ahead including the dazzling ocean, coconut plantations, and verdant tropical flora. The living area and dining area at Villa Sangkachai are both outdoors facing the gorgeous vista. The sunken living area offers seating for 14 people and comfortable seating. There is a bar with three bar stools, and ceiling fans to keep the space breezy. The villa accommodates a stunning, contemporary cinema room with padded walls, six jewel-toned velvet recliners, a projector screen, Apple TV, and air-conditioning. There is even a games room with board games, billiards table, mini bar, and a terrace. Just behind the swimming pool, tucked away in a glass-door pavilion is the dining area with seating for eight guests. There is the fully-equipped kitchen with an island, induction cooktops, espresso machine, and other amenities. 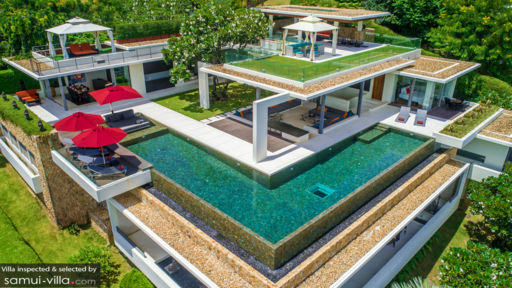 Villa Sangkachai is nestled in a gated community with 24-hour security and with a fully-serviced property with daily housekeeping, guest service experience, a personal chef to serve a complimentary breakfast, and airport transfers. Some services can be availed at an additional cost such as wine menu, laundry, car hire, etc. The villa has its own fitness room with state of the art fitness equipment. Found near Choeng Mon beach, guests of the villa can explore the serene surroundings where you will find numerous local shops and restaurants to your liking. The beach is more laidback ideally meant for sunbathing on your beach towels and enjoying the summer sun. The Choeng Mon Night Market on Wednesdays is another popular spot for you to visit with local vendors selling exciting wares, hawkers serving delicious street food, and other eventful sights.